Lake Havasu City is in Mohave County, Arizona. It was founded in 1964 and had a population of 56,355 according to 2006 Census Bureau estimates. State Highway 95 is the major thoroughfare through town. Lake Havasu City was built as a "planned community" along the shores of Lake Havasu. 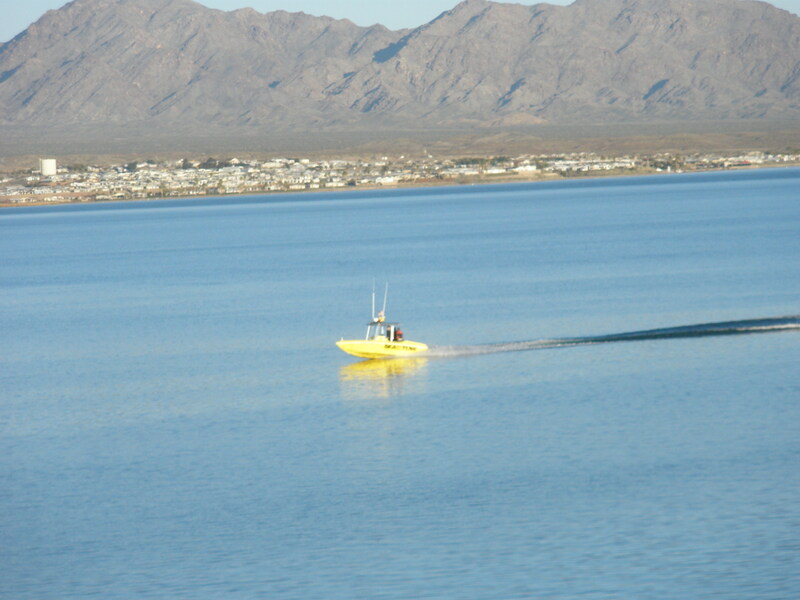 Lake Havasu City is known as the "Personal Watercraft Capital of the World." Being relatively young, Lake Havasu City does not have a "historic" or "old town" section. The main economic factor is tourism. The town is most known for the famous London Bridge, which was disassembled piece by piece, transported here, and reconstructed piece by piece. The Spaniards were the first Caucasians to explore the area, exploring and mining up and down the river in the 16th century. During the 19th century, there were Mexican outposts and American settlements in the area following the Mexican-American War. Mountain men made their way up the Colorado River near present-day Lake Havasu City in the 1800's, trapping for beaver. But the Mohave Indians didn't take kindly to the intrusion, and harassed the trappers into leaving the area. Prospectors began exploring the area later, building many settlements along the river banks. The area away from the river stayed remote and relatively unexplored. At this time there was very little here in the way of civilization. The area was extremely remote and rarely visited. About the only people who gazed on the remote ruggedness were prospectors and paddle-wheel passengers heading north to Ehrenberg. Construction of Parker Dam and the creation of the Lake altered the area permanently. As waters of the Colorado River backed up behind Parker Dam, all of the prospecting communities, landings and fishing villages were flooded and disappeared. Soon only the tops of giant cottonwood trees were all that remained visible. During World War II much of the area was closed by the federal government, and was used by the military to conduct test flights. Primitive barracks, an air strip and a rest and recreation facility were built on the peninsula that was to become Pittsburg Point. After World War II the military abandoned the site and fishermen reclaimed the area. A visitor would soon become well-known in the area, and the visitor had a vision. Robert Paxton McCulloch was born into a family of visionaries in 1911. A grandfather amassed a fortune investing in Thomas Edison's inventions, and his father was owner and president of the United Railway Company, a trolley car and inter-urban railroad. McCulloch and his two siblings inherited his grandfather's fortune in 1925. He attended Princeton University in 1928 and transferred to Stanford a year later. He had a love for boat racing, and had won two outboard hydroplane national championship trophies by the time he was 21. Two years after he graduated he married Barbara Ann Briggs, whose father was half-owner of the Briggs and Stratton Company. He began building racing engines and turbochargers for boats, and founded the McCulloch Engineering Company. In the 30's he sold the company to Borg-Warner for one million dollars. Later, McCulloch began building small gasoline engines, and created the first chainsaw with his name on it in 1948. His empire continued to expand. He created the McCulloch Oil Company and pursued oil and gas exploration. He owned an aviation firm called McCulloch Aviation. He also continued to pursue the outboard motor market during the next decade. His search for a test site for his outboard motors led him to Lake Havasu and ultimately changed the course of Arizona history. McCulloch purchased 3,500 acres of lakeside property along Pittsburg Point, and later purchased a 26 square-mile section of barren desert nearby for less than $75 per acre. The tract would become the site of Lake Havasu City. The town site was laid out in what would become a confusing manner for a first-time visitor, with roads looping off and back onto Highway 95. McCulloch purchased eleven Lockheed Electra's, and formed McCulloch International Airlines. Magazine ads soon enticed snow-weary easterners to fly for free to Lake Havasu City, where they were regaled and encouraged to invest in the area. The Lake Havasu Hotel was built to accommodate the prospective buyers during their stay. The Hotel was located on McCulloch Boulevard, offered a spectacular view of Lake Havasu, and was approached by the only paved road in the area. McCulloch opened a chainsaw manufacturing company in Lake Havasu City, and within two years the company had 400 employees. But McCulloch continued to seek an attraction for his city, and his quest took him to London. There has been a bridge over the River Thames in London for over 800 years. The first bridge was built in 1176 and lasted for 600 years. It eventually gave way to the ravages of Mother Nature, and was replaced with another London Bridge in 1831. By the 1960's the second London Bridge was gradually sinking into the river and it was decided to build a new one. But first, the older London Bridge was put up for auction. You guessed it: McCulloch submitted the highest bid at $2,460,000. He had a most implausible vision that would provide his community back home with an attraction that simply boggles the mind. McCulloch began dismantling the old bridge, labeling and numbering each stone brick. The dismantled structure was shipped through the Panama Canal to Long Beach California, then overland some 300 miles to Lake Havasu City. The structure was re-assembled brick by brick over an eight-foot deep bay to Pittsburg Point, which was transformed into an island by dredging the channel beneath the bridge. Re-construction lasted three years, and included construction of English Village with its' colorful exterior, immaculate grounds and vibrant flowers. The bridge was finally officially opened on October 10, 1971. Skeptical residents attended the dedication that included elaborate fanfare, fireworks, a parade, and other festivities. 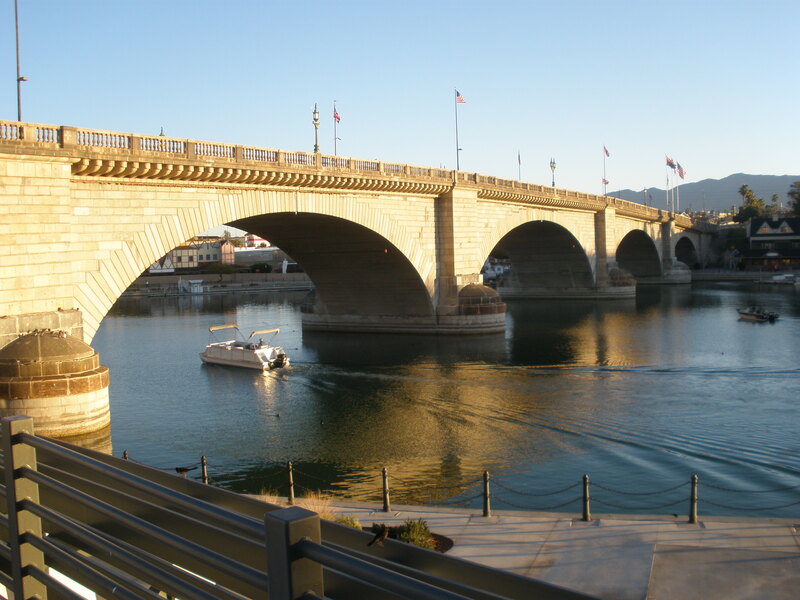 Today, Lake Havasu City is a vibrant and fast-growing community. The population increased 32% between 2000 and 2005, well above the national average. Many residents are retired, with only half of them in the labor force. Unemployment is very low (2.2%). Tourism is a crucial component of Lake Havasu's economy. Lake Havasu, looking toward the Havasu Lake Resort on the California side. Western Winter Blast is a four-day convention every President's Day weekend. The event is sponsored by the Western Pyrotechnic Association (WPA). "Pyrotechnicians" gather to buy, sell, and manufacture pyrotechnic supplies (fireworks). Pyrotechnic companies provide live demonstrations of their products, and a nightly "Afterglow Party" completes festivities each day. With the exception of a public display on closing night, the event is only open to members of the WPA. Other annual events include the "Skat-Trac World Championships" which is the culmination of the professional personal watercraft tour, the Relics and Rods Run to the Sun, a pre-60's street rod car show, the Festival of Lights over the holidays, which features over one million lights festooned on the London Bridge, and London Bridge Days in October celebrating the arrival of the world's largest antique. While not a civic event, Lake Havasu City is a destination place for students on spring break. Many of the resorts cater to students at this time by providing entertainment, festivities and special occasions. 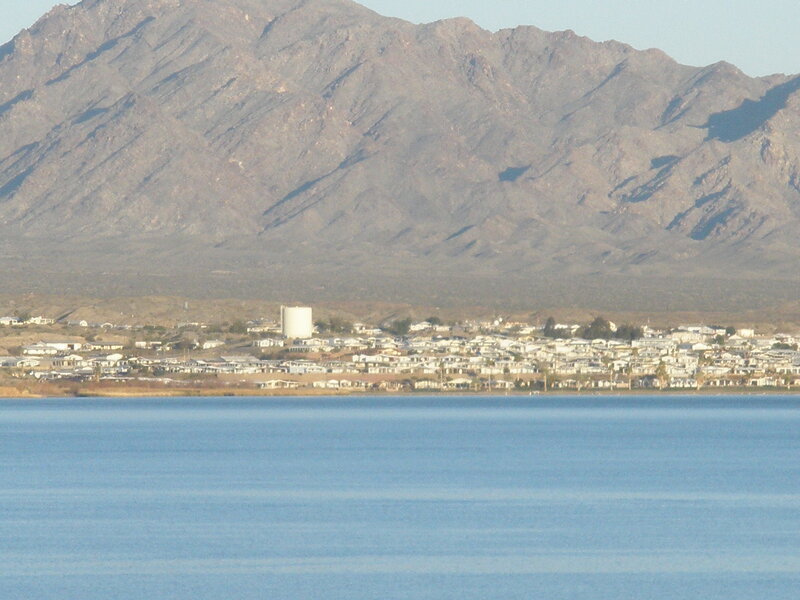 Lake Havasu City is in the southwest portion of Mohave County.  It is within the Lower Colorado subdivision of the Sonoran desert scrub plant community. A series of ridges and dry washes are to the northeast and southeast. It sits on a vast alluvial plain in the Mohave Mountains and Basin and Range topographic area. Crossman Peak is the highest point in the area at 5,100 feet, while Pittsburg Point is around 500 feet above sea level. The Lake Havasu Museum of History is located at 320 London Bridge Road. Exhibits include historical photographs of the area and of vintage aircraft, mining artifacts, Native American history, historic newspaper articles, period dress, and a scaled-down version of the London Bridge with accompanying construction information. Also exhibited are informational displays about steamboats on the Colorado, the Site Six military compound, and the early explorers of the Western Arizona region. The museum is open from 1-4 PM Tuesday through Saturday. Admission for the general public is $2.00, and children under 12 are free when accompanied by an adult. Lake Havasu dominates the recreational activities, but there are several other type attractions in the area. Many people who come to Lake Havasu City never explore the backcountry nearby. Six wilderness areas, historic mines, abandoned town sites, numerous trails and interesting geology constitute the bulk of the scenic attractions of the local backcountry. The 57-mile long Lake Havasu Scenic Drive follows the eastern banks of the Colorado River and passes through Lake Havasu City. Off-road trails and tracks which invite exploring, rock hounding, wildlife viewing and hiking are prevalent nearby. The Falls Springs Wash Trail heads eastward about ten miles from the eastern city limits, drops down into Falls Springs Wash, and climbs into the Mohave Mountains. But Lake Havasu is where the action is. The clear, cool, deep waters of Lake Havasu are well known for all types of water sports including boating, personal watercraft use, fishing, swimming, and non-motorized watercraft use. If you don't have a boat or jet-ski, you can rent one. Many visitors enjoy the relative tranquility of the lake tours on an authentic paddlewheel boat. Many coves and inlets along the shoreline are home to bass, catfish, bluegill, crappie and other game fish. In the deeper waters striped bass can be caught. Some of the geographic features of the lake include Grass and Beaver Islands, Copper Canyon and Copper Canyon Jump Rock, and an untold number of unnamed sand bars to haul out on. Many of the over 400 miles of shoreline lead to sandy beaches, estuaries and riparian areas where desert washes drain into the lake. Further upstream the lake narrows and enters Topock Gorge, which will be explored in the next chapter. Lake Havasu State Park is located on Pittsburg Point, and offers the Mohave Sunset Trail and the Arroyo Camino Interpretive Garden. The park is open for day use during reconstruction, and is scheduled to re-open for all uses in January 2008. Lake Havasu Marina, also on Pittsburg Point, offers long-term slip rental and is where many of the locals store their watercraft. As with many other lakes in the southern U.S., Lake Havasu is becoming infested with quagga mussels. Quagga mussels are a very small, prolific species of mussel that can clog pipelines, damage machinery and damage boats. They pose a very serious threat to water resources everywhere. The most common form of invasive spread is by way of attaching to watercraft, where they can then be transported to other waterways. All boat and watercraft users can reduce or eliminate the spread of the mussel by inspecting and cleaning all equipment after water contact. Many tours are available in Lake Havasu City, from 1-2 hour on-the-water tours to all-day tours. Tours include a narrated 1-hour lake cruise aboard the Dixie Belle replica paddle wheeler, a 2-4 hour tour to Copper Canyon and Balance Rock, and a day-long guided motor coach tour to the Bill Williams Refuge. There are eleven camping and RV parks listed in the Lake Havasu City Yellow Pages. Standard Wash is an OHV area five miles south of Lake Havasu City. This OHV offers more than 7,500 acres of challenging trails for many types of OHV opportunities and camping. It is operated by the BLM Lake Havasu City field office. BLM operates 105 shoreline campsites available by boat only. Some sites have shade ramadas, grills and rest rooms. No reservations are necessary. For more information, the listed phone number is 888-213-2582. The Beachcomber Resort has 100 RV sites with full hookups, a launch ramp and swimming beach, boat slips, showers, laundry and more. No web site was listed. The phone number is 928-855-2322. Located on Pittsburg Point, the Crazy Horse Campgrounds are located within walking distance of the London Bridge. 242 of the 632 sites have full hookups. Tent camping is available. The facility lists beach front sites, a boat launch, laundry, a general store, boat and jet-ski rentals, and a mile of beach for strolling. The web site is http://www.crazyhorsecampgrounds.com/, and the listed phone number is 928-855-4033. The Islander RV Resort boasts 36' wide by 50' long sites, all with full hookups, water sewer and 30 and 50 amp electric service. A large clubhouse is open between November and March. Summer rates are in effect between April 1st and October 31st. The summer rate for a basic site is $54 per day/$378 per week. In the winter, a basic site rate is $44 per day/$264 per week. Waterfront, 30-foot minimum head-in sites range from $89 per day/$623 per week summer to $69 per day/$483 per week winter. Other and additional rates may apply. The web site is http://www.islanderrvresort.com/. The phone number is 928-680-2000. Reservation information is available via E-Mail at info@islanderrv.com. Prospectors RV Resort offers daily, weekly, monthly and annual rates from $29 per day in the summer to $3,650 annually. Rooms can also be rented from $100 per day Monday through Thursday to $850 per month utilities included. Extra long RV sites allow you to leave your boat hooked. Windsor Beach launch is close by. Their web site is http://www.prospectorsresort.com/. The phone number is 928-764-2000, or they can be E-Mailed at info@prospectorsresort.com. Lake Havasu City has a host of places to stay for every lifestyle and price range. Prices range from $599 at the London Bridge Resort and Convention Center to $45 at the local Motel 6. Private homes are also available for rent at varying prices and frequencies. Many national franchise establishments are here, including Days Inn, Best Western, Quality Inns, Super 8 and the aforementioned Motel 6.